Even though February is the shortest month, it can seem like it’s the longest! To get us out of our winter funk and have a little fun this month, we’ve gathered up some awesome family activities happening in and around Des Moines. In addition to events listed below be sure to check out our Sweetheart Dances and Valentine’s Day Activities round-ups. You can find more seasonal fun in our Winter Fun Guide and our Event Calendar. Be sure to sign up for our FREE Weekend Fun Guide so you can get our best weekend event picks delivered to your inbox. Check out our picks for February for plenty of activities to keep your family busy all month long. Dreaming of warmer days, when you can work in the lawn or start a new project? The Des Moines Home + Garden Show returns to the Iowa Events Center this month featuring hundreds of exhibitors and ideas for home improvement. The much-anticipated sequel, “The LEGO Movie 2: The Second Part” reunites the heroes of Bricksburg in an all new action-packed adventure to save their beloved city. See this awesome flick this month at a movie theatre in Des Moines. Do you have a daughter Interested in learning more about science, technology, engineering and math? Girls and families of all ages are invited to SCI’s Girls in Science Festival on February 9th, 2019. Girls will have the opportunity to explore a variety of careers in the “STEM Zones” and connect with female role models and mentors. Skate with some of your favorite Des Moines area mascots during the Brenton Skating Plaza’s Mascot Skate. Take pictures and share this wonderful memory with family and friends! The annual high school sports invasion begins this month when the Boys State Wrestling Tournament and the Iowa Girls High School State Basketball Tournament wrap up their seasons at the Well. Find schedules and ticket info. on the Iowa Events center website. See your favorite Sesame Street friends in your neighborhood! Your favorite characters will be live on stage at Wells Fargo Arena in “Sesame Street Live! Let’s Party!” Two shows at 2:00 pm and 6:00 pm. If you can’t make it to New Orleans for Mardi Gras, the next best thing is to check out a Mardi Gras inspired restaurant in Des Moines, where you can enjoy the flavors of the Big Easy. Judy Moody’s latest adventure swings into the Des Moines Playhouse. Join Judy and Stink for their swashbuckling adventures on Artichoke Island in “Judy Moody & Stink: The Mad, Mad, Mad, Mad Treasure Hunt”. Lovingly ripped off from the classic film comedy “Monty Python and the Holy Grail”, Monty Python’s “Spamalot Young@Part”, retells the legend of King Arthur and his Knights of the Round Table in the silliest possible way. Hilarity will ensue this month at the CAP Theatre in Altoona. Polk County Conservation will be hosting a Bald Eagle Watch at the Jester Park Lodge. Attend an education session with a live eagle and then venture outside to view them in their natural habitat. 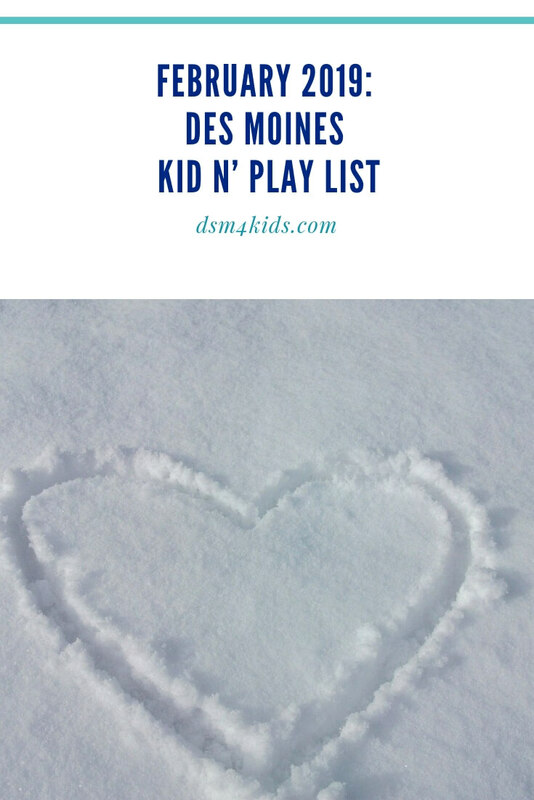 How will your family kid’n play this February in Des Moines? Let us know!